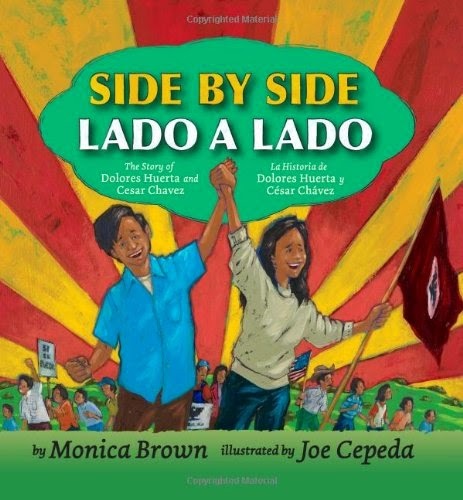 To the best of my knowledge, Side by Side/ Lado a Lado is the only bilingual picture book about the decades-long collaboration between César Chávez and Dolores Huerta, leaders of a labor struggle that organized thousands of the most impoverished workers in the US into an unstoppable force. Indeed, in the 1960s, “¡Sí, se puede!” and “¡Viva la causa!” were battle cries for human rights and social justice. The story begins with double-page spreads showing Dolores’s story on the left and César’s on the right-hand side. Here, young readers will see how their childhoods differed: Dolores is a talker while César is a listener; Dolores is an activist while César is an agricultural worker; Dolores’s family takes care of others while César’s family’s life is difficult. As adults, Dolores teaches migrant farm worker children while César labors in the fields. When the two meet years later, their life experiences become their organizational and philosophical strengths as they join forces to fight for justice in the fields. A helpful author’s note, geared to parents, teachers, and older readers as well, provides further historical information—such as the immigration act of 1986, and victories including collective bargaining, health benefits, pensions, and farmworker clinics—to supplement the picture book format. Cepeda’s mixed-media paintings—using oils, acrylics and collage on a bright palette of blues, oranges, yellows, greens and browns—are expressive and dramatic. Here are agricultural workers trying to escape the poisonous fumes of a plane spewing pesticides. Here are Dolores and César together, standing on a flatbed truck, speaking to a few somewhat-interested listeners. Here is César during his 26-day hunger strike, weakly looking out the window, while Dolores rallies the workers. And here is César’s funeral, with thousands of farmworkers and supporters honoring him. Cesar and Dolores asked people to stop buying grapes from California because the poisons the growers used there were making the workers sick. People listened, and the grapes rotted on the vines. The farmworkers won! They got a safer place to work, and the grapes became safer for people to eat. Here, the Delano strike, boycott, and secondary strike against California growers of table grapes—a massive struggle that lasted for five years—is collapsed into what appears to be one meeting. On the following spread, which depicts the 340-mile march from Delano to Sacramento, the text says that the purpose of the march was “to demand that workers get paid enough to live on.” But this famous march, in fact, occurred during the grape boycott, not after it was over, and it encompassed many demands, not just one. Nevertheless, Side by Side is one of the few picture books that demonstrate that César Chávez did not work alone and that Dolores Huerta was more than a political sidekick. Along with Carmen T. Bernier-Grand’s César: ¡Sí, se puede! / Yes, We can!, Kathleen Krull’s Harvesting Hope: The Story of Cesar Chavez, and Sarah Warren’s Dolores Huerta: A Hero to Migrant Workers, Side by Side / Lado a Lado is a valuable addition to a collection of picture books that bring the courageous struggles of migrant agricultural workers to an early elementary audience. Recommended.